Read more about my Music Teaching Philosophy and rate information below..
Woodwinds: $60.00 per student per month, non-refundable. 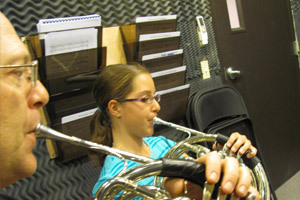 Brass: $60.00 per student per month, non-refundable. Percussion: $60.00 per student per month, non-refundable. Percussion:$60.00 per student per month, non-refundible. Keyboard: $60.00 per student per month, non-refundable. 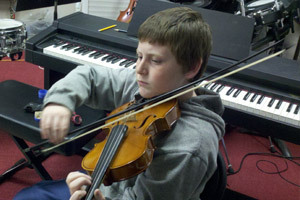 Orchestral Strings: $60.00 per student per month, non-refundable. Fretted Strings: $60.00 per student per month, non-refundable. Electric Bass: Beginner to AdvancedGroup Instruction: $15.00 per month, per player, 1-1-hour session per week for one month. My job as a music teacher is to take a student, at any age above 8 years, and provide them with the information and guidance to master their instrument. My standards and expectations remain high but each student requires slight modifications in teaching strategies and flexibility in how we reach these goals. Mastery of an instrument involves, not only playing the correct notes in the right rhythm and tempo, but performing expressively, with musicality and feeling as if telling a story. The highest level of musical performance is when the student has such mastery of their instrument that they are able to perform written notation in a way that the listener can feel the notation or is moved in some way. My students will receive honest constructive criticism and encouragement so they know what good musicianship is. One of the worst things we teachers can do to our students is to provide false statements in order to protect one’s self esteem. A good teacher will explain to the student, up front, that we will be honest about “wrong” and “right” and to ask the student to accept the truth as a positive way to move faster toward our mutual goals. I have found that students of all ages can understand the importance of honesty and truth, and prefer it over comments that enable negative psychological tendencies or attitudes that inhibit musical advancement. I believe that learning how to play a musical instrument improves a person in ways that can’t all be explained regardless of age and ability. I believe that learning how to play a musical instrument improves a person in ways we can't explain regardless of age and ability. For example I started a student on classical guitar at age 8 years old, with undeveloped motor skills, self-discipline or ability to focus on anything more than 5 minutes, now able to read and perform advanced classical guitar literature at age 14. My oldest student is retirement age with a desire to play her instrument better and contribute more to the local civic band or perform specials for her church on Sundays. This has made a huge difference in her playing ability; she is able to contribute more when she performs with the band, she feels better about herself, the band appreciates her contribution, and the audience is more satisfied. This student meets with me for a double session (1-hour) in order to accelerate improvement and plays in two civic bands and performs trumpet specials in church on Sunday. You see, learning how to play a musical instrument makes a difference in the player and enriches the lives of those who hear a well-polished performance by the musician. Our weekly instrumental music lessons are designed to get the most out of the lesson by providing 5-minutes to arrive, set up, tune and warm-up without my intervention when the student is ready. Then we have 30-minutes of instruction, followed by an additional 5-minutes for the student to properly disassemble their instrument, pack up, and be dismissed. This is to insure that no time is taken away from the actual lesson time and adequate time is allotted before the session to improve results when the assignment is checked at the beginning of the session. I use a balanced approach of “process” and “outcomes” based teaching strategies throughout my instruction with each student musician. The "process-approach" is sequential lessons that begin with a unique assessment of the student, taking into account individual strengths and weaknesses and providing instruction that will improve personal and technical development. The "outcomes part" involves recitals, studio recordings, music festivals, and other public performances like church specials if available and the student is prepared. My personal goal is to bring each student up to a level of mastery so they no longer need someone to help them read, rehearse, and perform music with proper technique, expression, and musicality. In other words, in a way that the audience ‘gets it’ or is moved by the performance in the way the composer intended (tell the story). Some students may want to continue with me as a musical coach which is common in the professional realm and I’m happy to do that as an option but prior to that, my goal is complete. I wish I could say that lessons and home practice will always be fun and that goals will be accomplished quickly but that’s not reality. I always tell my students and parents up front that, although professional or other accomplished musicians make performance look easy and fun to do, it is hard work. The rewards are not immediate like other popular activities and that’s why learning a musical instrument is the best way to develop “the person” over time. 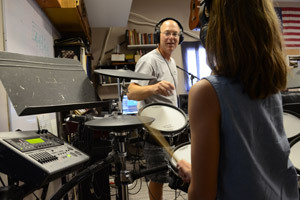 The student musician learns how to reward themselves internally by conquering little milestones and challenges that really never end until finally they are at the place where they become the one making it look easy and enjoyable. Not every person has a desire to be a professional musician and some simply want to be able to perform in their church, participate in their public school band, orchestra, or jazz programs. Some don’t know why they want to play and it is my goal to, through the music-building process and musical performance outcomes, help them find meaning in playing an instrument for themselves or for audiences. Some want to learn to play an instrument as a hobby; for personal enjoyment or with others for social reasons but the goal is always the same; the better the skills and self-discipline my students have, the better chance they have to continue and enjoy playing a musical instrument. ©2016 MP Vantage Solutions. All Rights Reserved. Site by Sonia Jones.